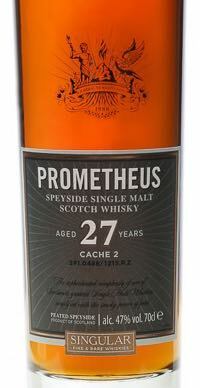 The Glasgow Distillery Company has announced the second release in its Prometheus Series – Prometheus 27 year old. Commercial director David Brown says: “Following on from the success of Prometheus 26 Year Old we have had strong demand to release the 27 year old. With its bold new packaging this aged Speyside single malt whisky is something we are very proud of. The bottle is beautifully packaged in a bespoke presentation box. T he design was put together with the help of brand strategy and design consultancy C21. Says Glasgow Distillery Co-founder Liam Hughes: “The concept and branding were created to reflect the quality of the whisky inside, which is both rare and of an extremely high standard – when its gone its gone. Prometheus 27YO single malt Scotch whisky will be available from specialist retailers and online from mid 2016, retailing at approximately £549 for a 70cl bottle at 47% ABV. Over the next three weeks, the new whisky will make its debut in three continents commencing with distribution partner ‘A Wee Taste of Scotland’ at the Munich Whisky Festival, then moving to Hong Kong for the Malt Masters Festival, debuting with Platinum Wines in a VIP tasting before travelling to Las Vegas to attend Mahesh Patel’s Universal Whisky Experience.